Remember that Mexican football (soccer) team that replaced its players’ names with their Twitter handles? Well, the mighty Stamford AFC, which plys its trade in England’s Division One South of the Northern Premier League, is adding the club’s Twitter handle to team shirts this season. But that’s not all. The jerseys will also feature QR codes, linking users to the club’s official Twitter feed. Advertising the Twitter handle is one thing, but it’s not entirely clear how much uptake the club expects with this QR code feature, when you consider the distance and movement of the players on the field. As UKSN notes, other sports have incorporated social media into official team outfits, such as Rugby League side Leeds Rhinos, The LPGA and the FA Womens Football Super League. But Stamford is claiming this as the first team – possibly in the world – to have the club’s Twitter handle and QR code on it. 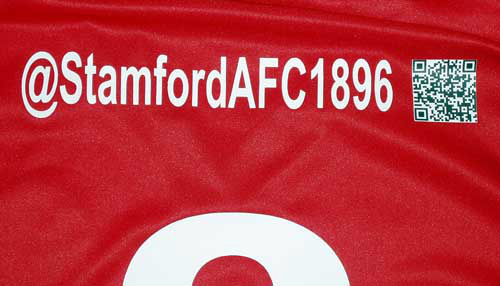 Stamford will debut the shirt in a pre-season friendly against Rotherham United tomorrow night. “As the relationship between technology and sport evolves I expect this will become a common practice; sports clubs, and perhaps more significantly players and brands, will look to interact with supporters in this manner,” added Rivett.